Join us for a rally at the I-5 Requeza Street overpass near Rancho Coastal Humane Society, between Santa Fe Drive and Encinitas Blvd. We will unfurl a large sign in lights that says "Issa, You Make us Sick" for all travelers on I-5 to see. We will be joined by San Diego Overpass Light Brigade. Bring your signs and battery powered candles, but no flashlights. Check our website or Facebook for more information. Join us for a "sick in." Bring you surgical masks, canes, walkers, etc., and let's show Darrell how we feel about him voting to take away our health insurance. CNN will be covering our rally and we need a huge turnout. Please attend the rally and show our strength! We're hoping for 1,621 attendees, the same margin he won by in November. Details. 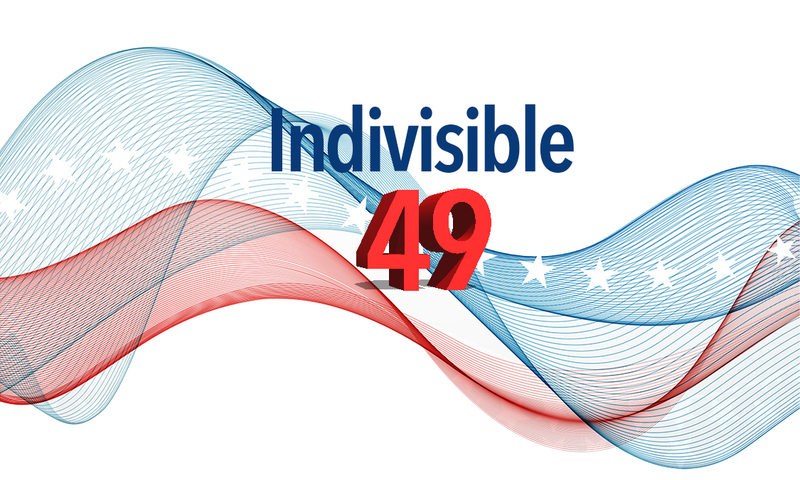 The 49th District Action Council, a coalition of progressive groups that Indivisible 49 is a part of and fully supports, is training people on how to engage voters and community members through neighbor-to-neighbor and other precinct operations. If you're willing to talk to neighbors about important political issues, please attend the training session. This effort is a cornerstone of the plan to flip the 49th! RSVP here. Our May 2nd rally focused on Health Care as we waited to see if or when the House would vote on Trump Care. We had a great turn out, with many people telling their stories about how devastating the health care changes would be for them, for their families and for our community. Photos of good people and great signs here. We were at Issa's office on May 4 - before, during and after the vote on the Health Care bill. CBS8 news was there as we told Issa's staff how angry and disappointed we were with his vote. Well darlings, you win some, you lose some. Obviously, we are all heartbroken over the passage of TrumpCare in the House. We should, at least, be heartened by the budget that was passed and kept money flowing to many causes that are dear to our hearts. Now is the time to be vocal about how reprehensible and irresponsible it was for Issa and all that voted yes on TrumpCare to vote for a bill that did not have a budget assessment, not one public hearing, and no one had time to actually even read the bill in its entirety--not to mention it will harm millions of Americans. But the worst thing is: the GOP doesn't even know how it will affect us. They got a notch on their belts at our expense. Make your anger felt. Call Issa or your Rep no matter if they are a Dem or from the GOP. Attend a rally! Make your voice heard!